Welcome to another side of the Genevan Institute for Reformed Studies. We are bringing God's Word to God's World as an educational ministry reaching out from Pinellas County, Florida to over 160 countries and territories. Our Bible based lessons are designed to help lay-people, students, teachers, and minisers as the study the Bible and what God tells us there. Please keep our ministry in your prayers. Participate live as we discuss the weekly topic. Our topics are suggested by those who attend each week as we work our way through the teachings of Scripture following the outline of the Westminster Confession of Faith. Written lessons on each section are available in our class syllabus. 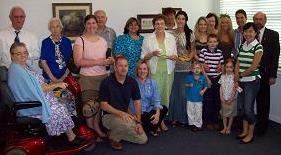 Our educational ministry was launched by Grace Presbyterian Church (PCA) in Pinellas Park, FL. The church closed after about 53 years meeting the spiritual needs of its families and serving to advance our Lord's Kingdom. We now continue that ministry to the world. Everything In It's Time Ecclesiastes 3 (final morning worship sermon of Grace Presbyterian Church). The picture at the right shows some who stayed late after worship one Sunday. The pictures below are from our last worship and fellowship time on June 27, 2010. We thank all those who came for this special time of honoring our Lord for his grace and blessings.